This seventh article, which is part of the series on Linux device drivers, talks about accessing hardware in Linux. Shweta was all jubilant about her character driver achievements, as she entered the Linux device drivers laboratory on the second floor of her college. Why not? Many of her classmates had already read her blog & commented on her expertise. And today was a chance for show-off at an another level. Till now, it was all software. Today’s lab was on accessing hardware in Linux. Students are expected to “learn by experimentation” to access various kinds of hardware in Linux on various architectures over multiple lab sessions here. As usual, the lab staff are a bit skeptical to let the students directly get onto the hardware, without any background. So to build their background, they have prepared some slide presentations, which can be accessed from SysPlay’s website. As every one settled in the laboratory, lab expert Priti started with the introduction to hardware interfacing in Linux. Skipping the theoretical details, the first interesting slide was about the generic architecture-transparent hardware interfacing. 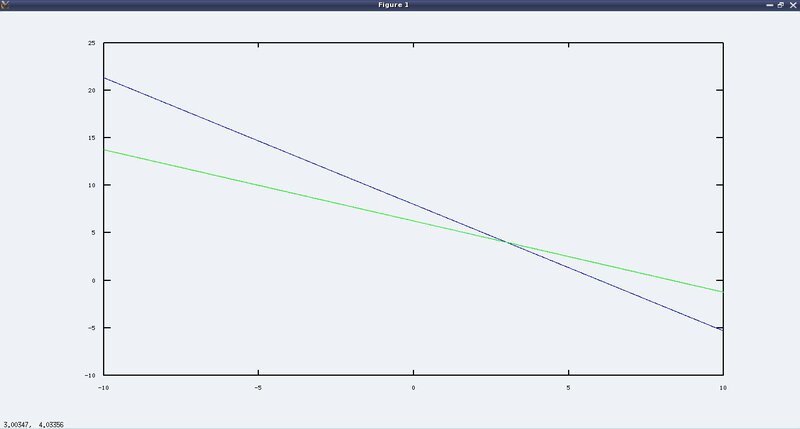 See Figure 11. The basic assumption being that the architecture is 32-bit. For others, the memory map would change accordingly. For 32-bit address bus, the address/memory map ranges from 0 (0x00000000) to ‘232 – 1′ (0xFFFFFFFF). 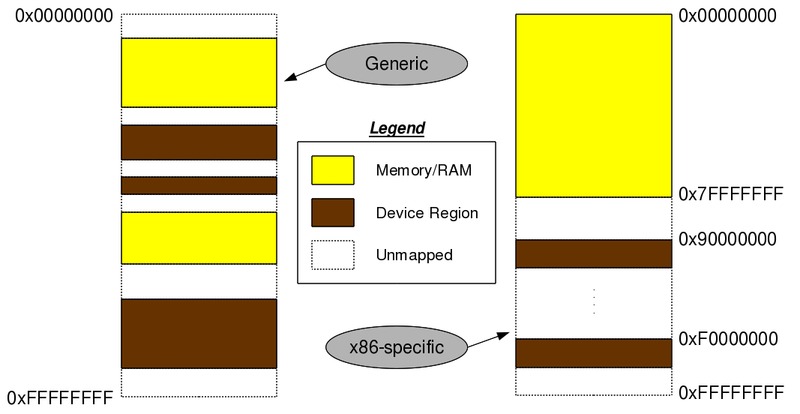 And an architecture independent layout of this memory map would be as shown in the Figure 11 – memory (RAM) and device regions (registers & memories of devices) mapped in an interleaved fashion. The architecture dependent thing would be what these addresses are actually there. For example, in an x86 architecture, the initial 3GB (0x00000000 to 0xBFFFFFFF) is typically for RAM and the later 1GB (0xC0000000 to 0xFFFFFFFF) for device maps. However, if the RAM is less, say 2GB, device maps could start from 2GB (0x80000000). Type in cat /proc/iomem to list the memory map on your system. 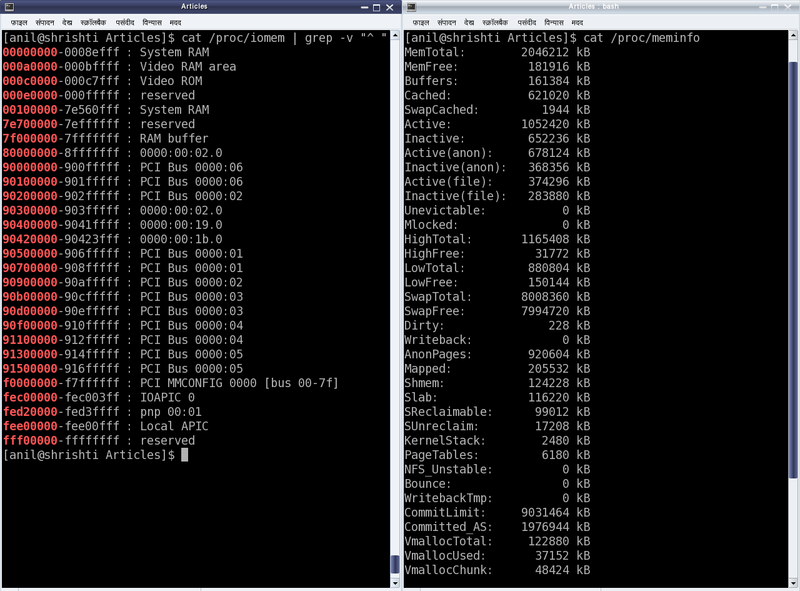 cat /proc/meminfo would give you an approximate RAM size on your system. Refer to Figure 12 for a snapshot. Irrespective of the actual values, the addresses referring to RAM are termed as physical addresses. And the addresses referring to device maps are termed as bus addresses, as these devices are always mapped through some architecture-specific bus. For example, PCI bus in x86 architecture, AMBA bus in ARM architectures, SuperHyway bus in SuperH (or SH) architectures, GX bus on PowerPC (or PPC), etc. Build the vram driver (video_ram.ko file) by running make with the same Makefile changed to build this driver. Usual load of the driver using insmod video_ram.ko. Usual write into /dev/vram, say using echo -n “0123456789” > /dev/vram. Read the /dev/vram contents using xxd /dev/vram | less. The usual cat /dev/vram also can be used but that would give all binary content. xxd shows them up as hexadecimal in centre with the corresponding ASCII along the right side. Usual unload the driver using rmmod video_ram. Note 1: Today’s systems typically use separate video cards having their own video RAM. So, the video RAM used in the “DOS days”, i.e. the one mentioned in this article is unused and many a times not even present. Hence, playing around with it, is safe, without any effect on the system, or the display. Note 2: Moreover, if the video RAM is absent, the read/write may not be actually reading/writing, but just sending/receiving signals in the air. In such a case, writes would not do any change, and reads would keep on reading the same value – thus ‘xxd’ showing the same values. It was yet half an hour left for the practical class to be over and a lunch break. So, Shweta decided to walk around and possibly help somebody in their experiments. When a pointer is tagged with __iomem, it enables that pointer for compiler checks &/or optimizations, relevant for I/O mapped memory. This entry was posted in Linux Device Drivers and tagged Device Drivers, Hardware, Hardware Access, LFY, Linux, OSFY on August 1, 2013 by Anil Kumar Pugalia.